A guide to understanding the Swiss that reveals a nation of people who are anything but the cuckoo clock-making, yodelling stereotypes generally portrayed. Swiss farmers are tough, independent, hard-working, resilient, well-prepared for every kind of natural disaster and above all staunchly conservative. These characteristics have been passed on to Swiss town-dwellers, who go about their day as if they too were farming a lonely mountain cliff. The Swiss stubbornly refuse to believe they are doing well and will even dispute the figures that prove it. So, like the poor donkey chasing the carrot, they pull their collective cart along ever faster, chasing the goal they passed years ago. The perceptions of the Swiss being dull, staid and boring while at the same time displaying a talent for ruthless efficiency and a limitless capacity for hard work are uncomfortably close to the truth. Likewise the clichéd impressions of high mountains, watches, cheese - with and without holes, chocolate bars and gold bars are genuine. The diversity of the Swiss is apparent in the degree to which they worry. The German-speakers do little else. The French-speaking Swiss are great visionaries and philosophers with noble thoughts and global dreams. They worry that their Swiss-German compatriots do not share these dreams. The Italian-speaking Swiss are less interested in the solid values of work and have a terrible tendency not to worry nearly enough. I work in the US for the Swiss. This little book is very funny and fun to read. At the same time it is amazingly insightful with regards to Swiss culture, customs and people. I sometimes give it to others doing business with the Swiss. 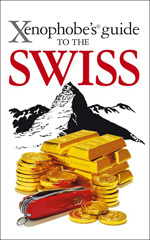 As a Swiss I read this book with great pleasure since it is very funny but true indeed. As a foreign reader you will find lots of hints and information to help you understand Swiss mentality and differences between cultures in one small country. The author manages to sum up every aspect of the Swiss with a typical British sense of humour! Having lived in Switzerland for some time now - this book was still able to teach me some idiosyncrasies of the Swiss I didnt know. If you want to find out who what where why and how the Swiss do things - read this book. Essential reading for the smallest room in the house. The Xenophobe's Guide to the Swiss is a literary jewel, so very accurate and timeless, CONGRATULATIONS! The opening paragraphs of a Xenophobe's Guide to the Swiss set the tone for the rest of an irreverent, amusing and highly informative portrait of the Swiss people. An enlightened new series, good natured, witty and useful. The Xenophobe's Guides to different nations deserves a real cheer. Online eBook. Click on button below to sample.